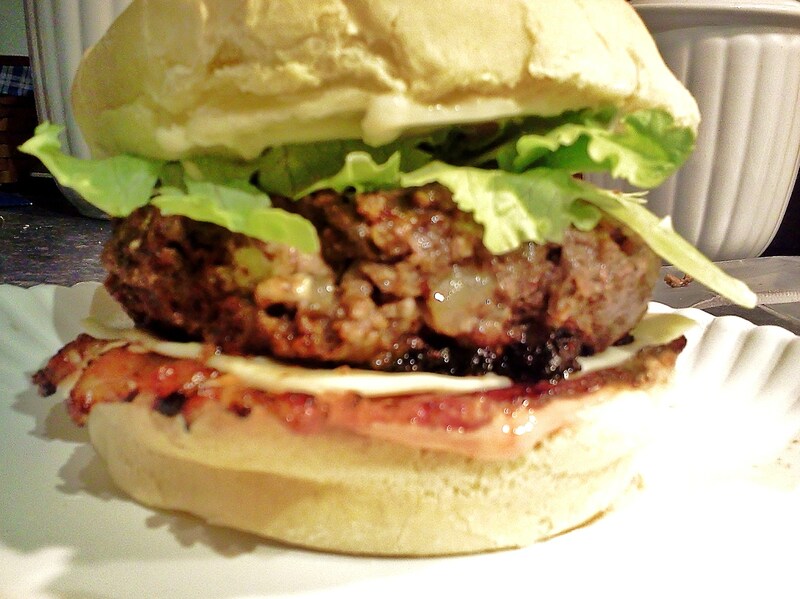 This recipe is the most amazing burger I have ever had. It’s adapted from a recipe I got off of allrecipes.com and I added my own little twists. The recipe was originally for turkey burgers,(which I had never had until this) and then my husband requested beef burgers. Both have completely changed the burger for us! I would definitely recommend trying it both ways, don’t be afraid of ground turkey! It’s really not as scary as some people think and even my husband loved it! There are a few things about this recipe that can be changed. For example, if you do not like onions I would suggest sauteing them first for a softer and more subtle taste. Although I wouldn’t recommend it, you can leave them out if it’s a huge problem. 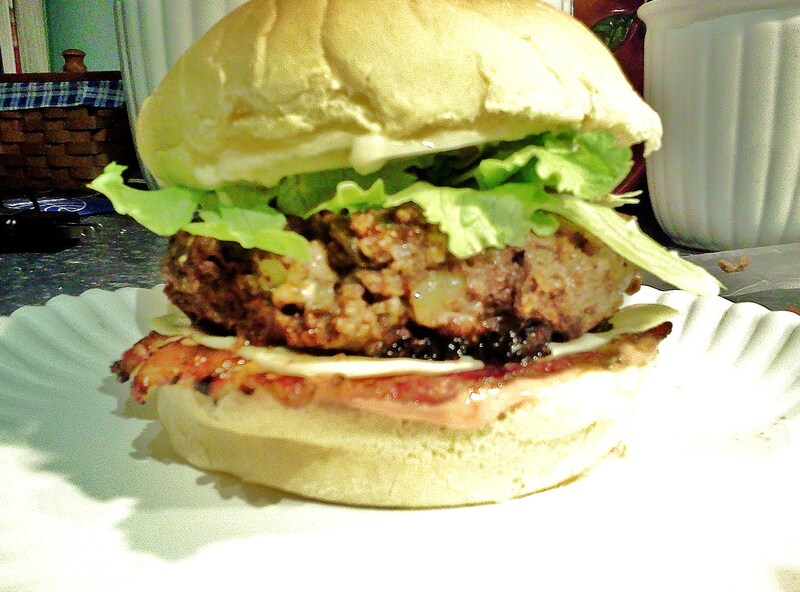 Next, the Adobo peppers may scare some off, but they add the entire flavor of the burger and are not overly strong. They don’t add much heat to the burger either, but if they make you nervous you can try just putting one in instead of two. However, do not exclude them completely, you won’t regret it, I promise! Last, the jalapenos add the heat. I personally like everything REALLY SPICY! My husband on the other hand, well, not so much. I usually mix everything without the peppers, throw in a tiny bit for flavor, make his burger and then mix the rest of the peppers in for the rest of us heat lovers. He likes it better this way and it allows us to both be happy with the heat level of our burger. I like to add a lot of jalapenos, approximately 8-12 slices depending on size, then I chop them at the same time as the Adobo peppers to save time. I chop them as finely as possible and then throw in a tiny bit of the mixture and add the rest later. If you don’t like it that spicy you can use less jalapenos or exclude them all together. They really don’t change the taste as much as the adobo peppers. I also want to add that I never measure and I don’t really know if these measurements are accurate. The burgers will turn out fine, but feel free to add whatever amounts you prefer. I really like garlic so I usually put a little extra garlic in. P.S. These burgers are REALLY messy! You may need to shower after devouring these delicious things! Best Turkey or Beef Burgers Ever! Chop onions as finely as possible, chop adobo peppers as finely as possible, chop as many sliced jalapenos as desired as finely as possible. Mix all ingredients in large mixing bowl. Break mozzarella ball into small chunks until desired amount (I usually use approximately half a ball per lb of meat) and mix into meat mixture. Don’t be afraid to mix with your hands! 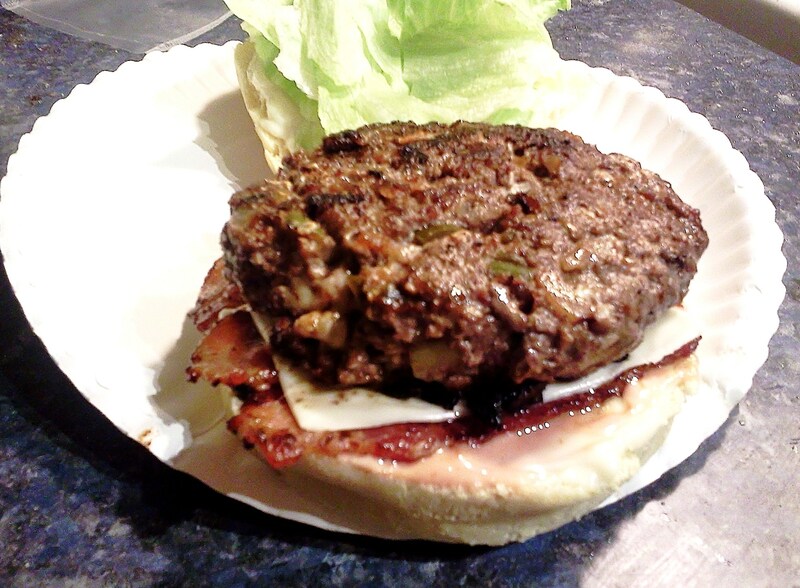 Mix well, form into burgers and grill with bacon. Top with slice of cheese. If you chooses to add Cilantro, chop as finely as possible and add into meat. I have trouble finding it in my local store, although it does make the burger much better. Assemble burgers with bacon and other desired toppings. Best turkey burger I ever had!! Yummy! Thanks for making it for Gramps and I…totally mouthwatering!